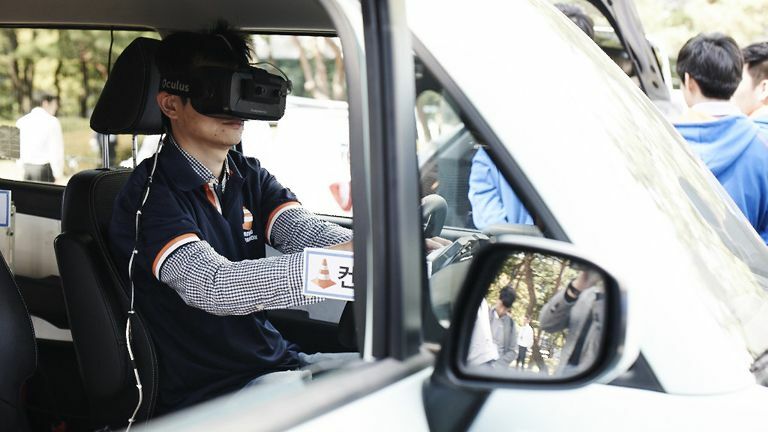 Can wearing an Oculus Rift in the car make you a better driver? On a visit to Hyundai's South Korea campus, I'm given a pretty surreal welcome. As I step off a bus the first thing I see is a car slowly headed in my direction. That's not the weird part; I soon realise the driver is wearing an Oculus Rift, apparently obstructing his vision entirely. “That can't be safe,” I think, before it dawns on me: I might be about to endure the slowest, most embarrassing death ever. As it turns out, the driver could see me fine. This was one of the many projects being shown off at Hyundai and Kia's IDEA festival, a space where R&D employees can show off some of their more elaborate ideas. This idea in particular - the one slowly headed in my direction - is called Driving Expansion, and it wants to solve the problem of not having enough driving courses in South Korea. With this concept, you'd only need a big open space, a car, and an Oculus Rift. Here's how it works. The Oculus is hooked up to a computer that builds a “course” for the driver to traverse, augmenting objects into the driver's vision. While wearing the Oculus, a number of cameras attached to the car mean the driver will see what they'd see were they not wearing it, but they'll also see things that aren't there. In the demo we saw, a set of virtual traffic cones had been set out ahead for the driver to move around. Right now the idea is being considered as a means for testing cars that roll off the production line, but it's also being considered for other applications, including teaching people to drive. More work needs to be done before then, which includes improving the look of the augmented objects. “We want to make it more three-dimensional, more realistic,” one of the team members said. Inside this particular car was a PC and a built-in GPS computer, meaning all that was needed was the driver themselves. A virtual course of obstacles can be set up in a matter of seconds. The team also told us that the project reduces testing time quite significantly, while also reducing the likelihood of accidents - it's hard to collide with something that isn't really there, after all. There were plenty of other interesting ideas being shown off at the festival, including a bike that cleans your clothes and a zeppelin that turns air into water. You can see the whole lot by clicking here.